I’m concerned how controversial and emotional issues have clouded discussion about a peripheral canal or pipeline. 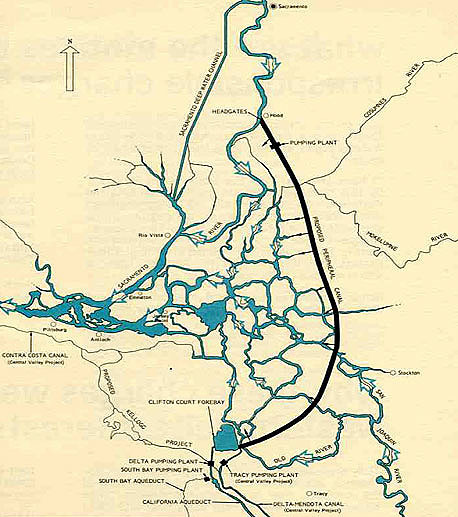 As far as I’m concerned, a new delivery route around the delta is probably the only way to protect the southern half of the state against a complete cutoff of water from the north due to potential delta levee failures and saltwater intrusion from rising sea levels. As long as we’re pumping water out of the delta, that danger exists. When the breaking point for the delta is reached, it will be catastrophic for SoCal — and taking the long-term view, such a delta malfunction seems inevitable. As for the argument that a bypass development would allow greedy SoCal agribusiness and cities to take more water than ever, I believe safeguards could and should be implemented to assure it would not be used to increase the amount of water sent south. For me, the most important thing is to provide a safer route for transfers of agreed-upon amounts. Reliability and security is my concern. See also this recent comment about north-south water transfers, and from about a year ago this interesting observation, both from On the Public Record. This entry was posted on April 23, 2010 at 12:01 am	and is filed under Environment, Politics, Water. Tagged: Peripheral Canal. You can follow any responses to this entry through the RSS 2.0 feed. You can leave a response, or trackback from your own site. You mention that you think “safeguards could and should be implemented to assure it would not be used to increase the amount of water sent south”. What would those safeguards look like, how would they work, and who would enforce them? If that had been made clear in the water bills that passed in the legislature I may have been inclined to support the giant ($11 billion) water project bond on the ballot in November. But since they were not included in the bill package, I plan to vote No on the bond initiative this Fall.